When Steve Jobs declared Adobe Flash a dead platform three years ago and banned it from Apple devices, the rest of us cheered and looked forward to the shift away from Flash in favour of HTML5. The trouble was, and is, many web browsers were unable to reproduce Flash effects in HTML5, while web audiences became used to Flash-based transitions where everything moves and flips. There are still homepages that are wholly encapsulated in Flash that you can't get past; FLV-format Flash video is ubiquitous, SWF (Shockwave Flash) files persist. It is so deeply embedded that it's one of the few formats that can be viewed cross-plaform on various devices including mobile and tablets. Which is why many sites that feature digital publications use embedded Flash-based viewers, adding those page-curling ('toe-curling') page-flip animations. Skeumorphism, I believe it's called; the design concept of making digital artefacts resemble their real-world counterparts; faux-leather bindings, stitching, page-curls. Oh, please. My digital calendar is not a Filofax or Collins desk diary. Adobe Flash has been dominant because it was the de facto standard for multimedia features for so long, and however much HTML5 has caught up to Flash in the web-multimedia, it seems to have barely nudged the course of the web super tanker. We said at the time that sooner or later HTML5 will replace Flash technology. Turns out it's later. Much later. Despite the advantages - simplified services with no need to install complex, insecure plug-ins - the disadvantages of HTML5, from newness to high resource consumption, are holding it back. 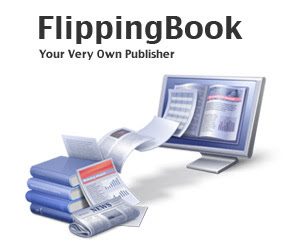 FlippingBook was one of the first companies to offer software previewing PDF's with fancy page-turning effects. Currently it's document viewer, which we're using, displays publications in Flash, HTML5 and plain HTML formats - in that order, depending on what browser and HML5 support it finds installed on the client device. FlippingBook also has settings to prevent downloading and printing of the source publication, which in theory makes it ideal for providing read-only resources. In theory. Unfortunately, those read-only settings get lost when the publication is rendered down in the plain HTML format. Here, the publication is just a set of web pages inside a container. I don't run Flash on my Linux machine, or on some Windows 7 and 10 installs. Iknow, it's a tough call, but I'm getting by just fine without it. But as I discovered, with no Flash, a switched-on user can do anything they like with that content. Which pretty much blows the read-only product idea. What now? Unfortunately, there is no clear successor to the Flash-based previewer and the PDF itself remains notoriously insecure; passwords are a cheap, but inconvenient and crackable means of protection, whilst conventional dial-home or digitally finger-printed DRM costs money and is a royal pain in the rear for both publisher and consumer - which is why so many publishers have abandoned it.